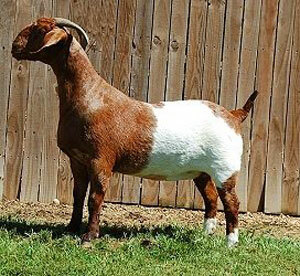 Purebred (94%) tan and white dappled paint Boer doe. This doe is beautifully marked and made. Sired by WARDS I Am Sam I am and out a beautiful show doe. This doe has a huge frame and great bone and good length of hip. 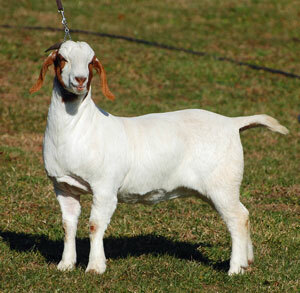 She is long and feminine with beautiful breed type with a strong convex head. Six ennoblements on her papers. Her sire has 143 ennoblement points and her dam has 58 show points. 2+2 teat structure. DNA tested. 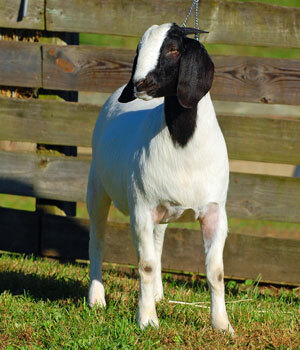 Black and white paint/dappled fullblood doe by RRG1 Ridge Rare Breed, son of **Ennobled** RLP Bull City Cherokee and out of a Max Boer Goats doe. This doe has been an easy breeder and kids easily. She milks well. She has been a very productive doe for Stillhouse Farms and we jumped at the chance to put her in our herd. Hoping she will give us as much color and quality here on our farm! Red paint fullblood doe by WARD'S CAT IN THE HAT X111 **ENNOBLED** and out of S G R POLAR'S I'VE GOT LIPSTICK **ENNOBLED**. This beautiful show doe's pedigree and show record speak for themselves. Her full brother, **Ennobled S G R Klondike, was 2015 National Reserve Champion Fullblood Buck. She is long, wide and balanced with strong breed character. It is hard for me to pick this doe apart. 2+2 teat structure. Lipstick has 317 progeny points and her son S G R CADDY'S BRING IT ON is now ennobled. Not only does this doe have the show credentials, she has been super hardy, raising kids and living in a herd situation with no special treatment and very little health maintenance. She maintains weight well and is a great mother. Red paint percentage (75%) doe by a WARDS I Am Sam I Am son and out of a daughter of ennobled Shill AK Mr. Cool who is a son of ennobled Alto AK Mister V37. Her sire Rebel Ridge Patcher has over 125 show points and passed visual inspection for ennoblement but passed away before getting his progeny points. I can't say enough about this doe. She stays in show weight (without a trace of toxemia) despite raising kids every year with good gains . 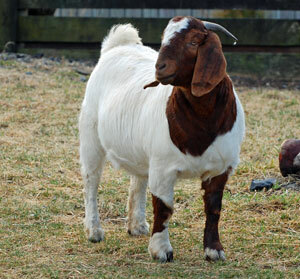 She is one of the only goats on the farm that never limped from foot problems in our year of extreme weather. She rarely needs any kind of maintenance and has an easy going personality. And she has a ton of style, muscle, and bone. 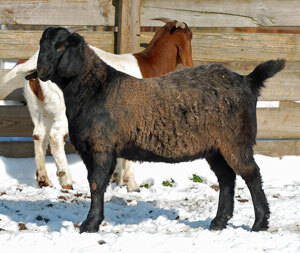 ADGA registered 50% grade black roan Nubian doe, GN1722503. G6S normal by testing. Beautiful breed type. Very nice udder. 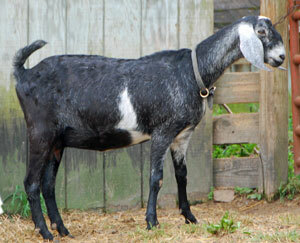 Dizzy is higher than 50% Nubian but paperwork on her dam was not available. Since we use her on our Boer bucks her registration status is not important to us. 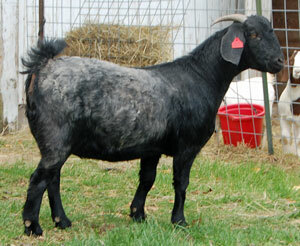 Nubians are a great cross with Boers due to similarity in head/ear style, size, and topline. Dizzy's milk is used for our cheese making and for any bottle kids. She has a lovely personality and her udder structure makes her very easy to milk with long teats and nice sized orifices. 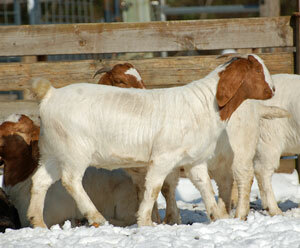 Her doe kids are that perfect Nubian Boer cross that work so well for any starter herd or homesteading/commercial herd. 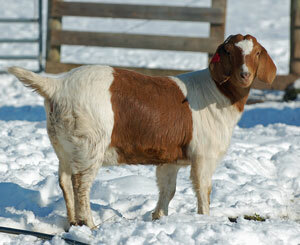 She has been extremely hardy and lives well in our Boer herd. 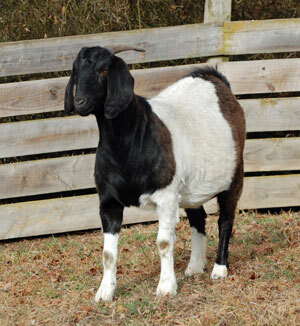 Purebred (97%) solid black doe who is a direct daughter of **Ennobled** RLP Bull City Cherokee and out of Double Stuff, a black and white paint/dappled doe, by a son of **Ennobled** MAX Boer Goats Red Hot Dappled $. There are not many direct daughters of Cherokee out there anymore. He always sired square built, stylish, hardy kids. Despite her smaller frame, she is one of the best mothers on the farm. 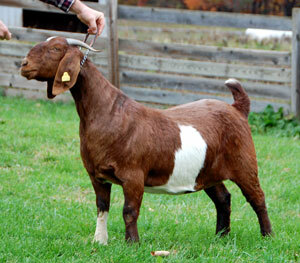 Traditional percentage (75%) doe by RBGO Hurricane Glory and out of Red Velvet by **Ennobled** RLP Bull City Cherokee. This is a beautiful feminine doe with length, plenty of bone, a beautiful head and level topline. 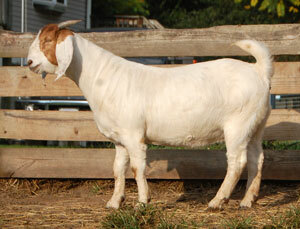 With 25% Nubian, she has great maternal traits and has the most beautiful udder with great milk production and kid gains. Fullblood black doe with length, level topline, and style. She screams femininity. She has already raised triplets as a yearling and kidded triplets again before her second birthday while maintaining great condition. She comes from a breeding program that focuses on parasite resistance, growth, and hardiness. Traditional fullblood doe sired by WCOR Bo-On-Target and out of a daughter of AABG NBD Goldman, a son of Status Quo **Ennobled. This doe comes from the well established breeding program at Locust Haven Farm. This doe is a stand out in the herd. She is a long and level topped doe with great bone and an abundance of muscling. We are super excited to have her in our breeding program. She has been a good mother with a good udder/attachment. Her kids have been some of the stoutest kids born here. Traditional fullblood doe sired by WCOR Bo-On-Target and out of a daughter of AABG NBD Goldman, a son of Status Quo **Ennobled. 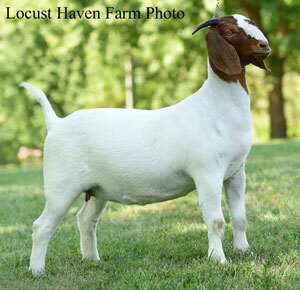 She is from the breeding program of Locust Haven Farm. We jumped at the chance to buy this full sister to Sapphire above, along with her doe kid from this year. She is a big boned, big bodied doe. Percentage (50%) black and white paint doe sired by JAG2 CODI Charlie Chaplin (10674659) and out of a black commercial Boer/Kiko doe. We retained this doe for her great growth in a low grain input management style. She will likely be used primarily for our meat production herd. 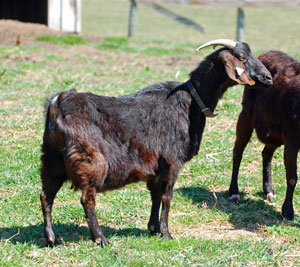 Grable's kids have some of the highest growth rates in the herd and catch the eye of every visitor to the farm. 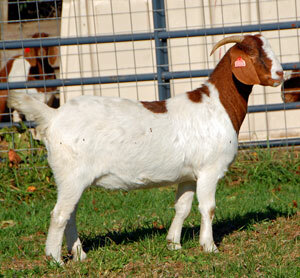 Her kids would be great for anyone starting into goats or that wants a low input commercial herd. 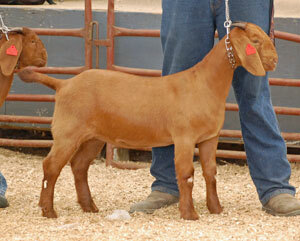 Fullblood traditional doe with red front legs by RBGO Hurricane Glory and out of LHF5 Lilliana Lou Who. Lola has been our heavy weight yearling. She is an easy keeper and very hardy. She is long, wide, and level. We hope to build a doe line from her offspring. Lola is a natural mother. She will be kidding for the second time before her 2nd birthday. Percentage (50%) black dappled doe by RBGO Hurricane Glory and out of Zoey, a big broody black dappled commercial Boer doe. She has been hardy and required very little management. She has a nice spring of rib and a level top. 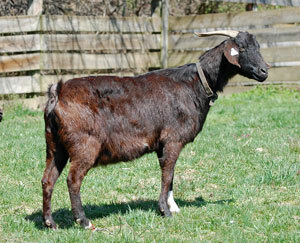 Purebred (94%) traditional doe bred by Locust Haven Farm. Her sire is a PDF Z012 FULL PROOF ENNOBLED son. "Bubba" has accumulated 52 progeny points in limited showing as well as siring 2 overall champion wethers at 2 different Virginia county fairs. Her dam is an easy keeping doe who has 55 progeny points. Moorena was shown lightly and was Junior Grand Champion Doe at Maryland State Fair. 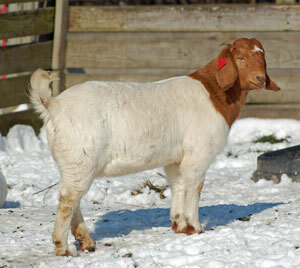 Moorena is a stylish, correct doe that we are excited to add to our breeding program. 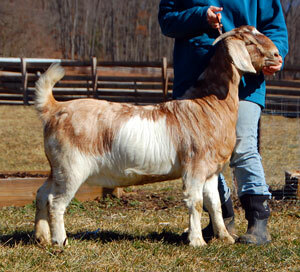 Purebred (97%) blonde paint doe by **Ennobled Lindsay Acres Devil Dog and out of Rebel Ridge Snowin' Down South. 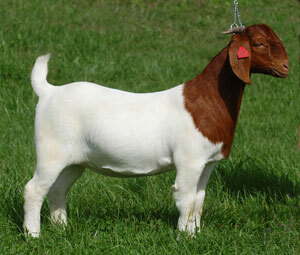 This doe is from show genetics top and bottom of her pedigree. Her dam is tall, long, and big boned and the most capacious doe we have, carrying a total of weight of over 34 pounds of kids in one of her pregnancies. Her Ennobled sire carries a ton of muscle, bone, and width. Fast growing with plenty of bone and length of leg. Quad. 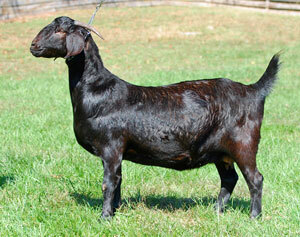 Fullblood black headed traditional doe kid by **Ennobled Lindsay Acres Devil Dog and out of CSF95 Licorice and Lace. This elegant doe has beautiful long lines and plenty of length of leg. She is one of the best growing kids from 2018 and should be a fantastic dam. Fullblood paint doe kid kid by **Ennobled Lindsay Acres Devil Dog (10649367) and out of **Ennobled S G R Lipstick's Painted Version (10637766). Vamp has a strong show pedigree and a classic shape. We are excited to cross her on Deuce for added size and style. Fullblood traditional doe bred by Middle Lane Farm. By **Ennobled FNHR High Output and out of a Locust Haven doe. This doe has a super elegant front end with so much eye appeal. She is level over the top and correct in her leg structure. 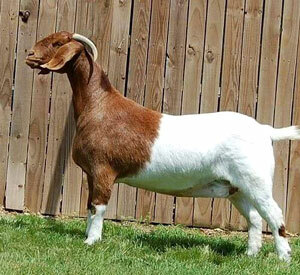 Fullblood traditional doe by **Ennobled FNHR High Output. Bred by Middle Lane Farm. Stout made, wide doe. Should be an easy keeper and good milking doe like her dam. Full sister was recently Reserve Jr Champion doe at the Summer Jam 2018. Fullblood traditional doe kid by **Ennobled Lindsay Acres Devil Dog (10649367) and out of LHF5 Bo's Beautiful Sapphire (10721052). Thick muscling, correct legs. Nice stout wide doe kid. 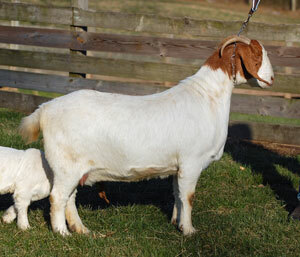 Fullblood traditional doe by a Coni Ross buck and out of LHF5 Bo's Ornate Tamara from Locust Haven Farm. We were excited to get this doe kid from Cedar Heights Farm. Good bone, level top, good head shape. Hardiness and ruggedness on the top of her pedigree and show genetics on the bottom. Purebred (98%) black doe kid by **Ennobled FNHR High Output (10681393) and out of BUGS Cherokee's Walelu (10700160) by RLP Bull City Cherokee **Ennobled. This is a wonderful outcrossed pedigree. 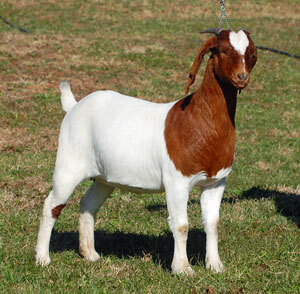 The top of her pedigree is a modern show type and the bottom is old style with an abundance of hardiness. She has a classic head and plenty of bone. Boer-dairy cross doe by a Coni Ross buck. 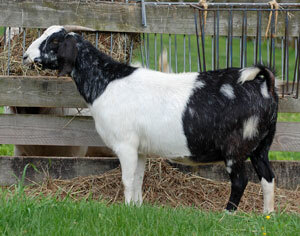 Hardy genetics and should be a great milking doe. We hope to use her for our meat program and to foster any possible bottle kids. Despite having a dairy look she carries a wide loin. She is one of our biggest framed juvenile does although she does not carry the bulk of the fullblood does. She does have a surprisingly wide loin. Fullblood all red doe kid by LAZYE Chuck A Deuce (10674237) and out of BUGS Klondike's Lipstick Smudge by **Ennobled SGR Klondike (2015 National Reserve Champion buck). This doe kid is a standout. She gets noticed by everyone that comes to the farm. She has that classic rectangular shape with a level top and beautiful head. 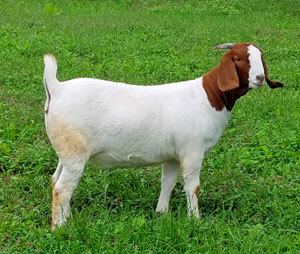 Fullblood traditional caped doe kid by LAZYE Chuck A Deuce and out of BUGS Klondike's Lipstick Smudge by **Ennobled SGR Klondike (2015 National Reserve Champion buck). Beautiful doe kid with a ton of eye appeal. Kiss has caught my eye since day one. She has grown into a very stout young doe. 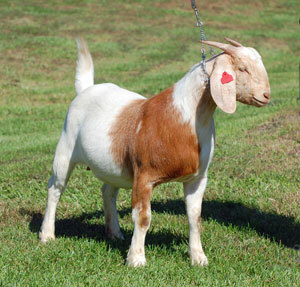 Looking forward to breeding her this fall. 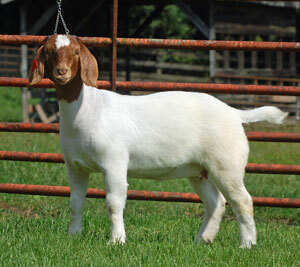 Fullblood traditional doe kid by LAZYE Chuck A Deuce (10674237) and out of BUGS Wild Fire by RBGO Hurricane Glory.